Summer's here. The first gloriously hot day in June with sunbathers on the beaches and the odd intrepid swimmer in the as yet slightly chilly water at the start of the season. We needed to go to the big retail parks just outside Figueres and so took the chance to make a day of it with a walk by some of the smaller beaches past Roses - Canyelles Petites and Canyelles Grans and Almadraba Platja. Roses itself sits on a broad wide beach that connects all the way around the Gulf of Roses down to L'Escala. We'll include Roses more fully at some other time, but it is one of the main towns on the coast full of French holiday makers, many of which have popped across the border for the day or have holiday houses here as it's only about 40km from the border and closer to Perpignan than Girona. The town has a huge Ciutadella - a walled fortified area that used to surround the old town as Roses had an important strategic and defensive position militarily. 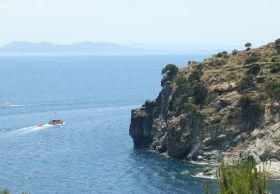 The walk though starts on the other side of Roses at the beaches of Canyelles and then more into the Cap de Creus area. We're two weeks away from July on a blazing hot day and yet the parking is relatively easy. It's always surprising just how short the summer season is. At the height of summer parking would almost be impossible. 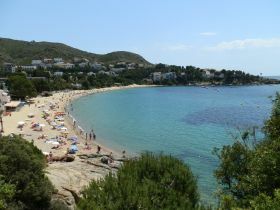 Canyelles has two beaches - Petites and Grosses. 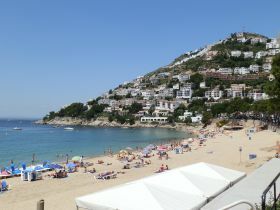 Both are fine golden sand with clear blue water and a gentle gradient into the water and are backed by relatively steep slopes peppered with houses overlooking the bay. We join the path (GR92 again) at the corner of Canyelles Petites - for a longer walk you could start from Roses itself. Almost immediately we are walking past one of the many beach-side restaurants. The path curls around the headland past a small string of rocky islets that you can wade across to. There are views everywhere. Straight ahead of us across the Gulf of Roses we can see down to the Isles Medes and make out the castle on top of Montgri. To the right is the beach line that runs along the bay with the huge apartment block at Empuriabrava dominating the beach line. At this distance it looks quite majestic. Behind the beachline are the mountains in the distance fading into the background in the hazy summer air. As we walk around the headland various orienteering race competitors come round the headland looking for the next marker on their race. We walk above a water-side restaurant that has topped it's sunshades with palm leaves then pass another string of islets to the right, before turning down to the beach of Canyelles Grosses. As it's name suggests this is a longer beach, but the same golden sand. Behind the beach, almost directly on sand are another collection of beach side restaurants. It's a little early for lunch, so holiday makers are taking coffees and beers at the tables. The GR92 runs along the beach, but we're walking with a dog and in summer dogs aren't allowed on the beaches. Strictly they're not supposed to be on the beaches in the winter either, but if there's no-one about no-one complains, particularly if you leave the beach as clean as when you arrived. So to get round the beach we have to climb a long flight of steps up to the road and then walk around the outside. There are more parked cars and it seems that almost every other car is French, and as we pass a group of houses the 'to let' sign is in French (A Louer) rather than Spanish or Catalan. The road takes us around the beach and out to the edge of the estate. We then follow the sign on to a single track path heading towards Cap Falconera. The path is relatively dry with just a few cypressa trees for shade and a rocky shore below us. The path runs up and down following the coast and we have to step aside a few times to let more orienteerers pass. Mostly Cap de Creus is covered in low shrubs so there is relatively little shelter from the sun (do take water, hats and sunscreen). In the bay to our right speed boats are racing around the cape, possibly heading to Cadaques and we can hear the screams and shouts of the passengers as the boat skims and bounces along the water. Following the path we reach the tip of Cap Falconera. To the right are the houses and villas of Roses. To the left are the barren wilds of Cap de Creus and in the distance boats moored in the bay of Montjoi, where the famous El Bulli restaurant is situated. We continue along the path along the other side of the Cap. Ahead of us, the orienteers have marked off half of the side of the hill and we can see someone competitors waiting with climbing gear - it seems they will have to climb down the cliffs to get one of their markers. As we walk around the next inlet we can look back and see some competitors abseiling down a cliff-face of 20-25m in height but with instructors present to make sure nothing goes wrong. We have to scramble down to the next bay - the dry gravel and steepness of the slope down is slippy underfoot. At the bottom we reach a pebbly naturist beach. It seems isolated apart from the footpath and a couple of boats. Our aim was to walk down to Montjoi, but the path connections back aren't so good and the heat is getting to us (and our dog) a little because of the lack of shade. So we decide to start the loop back a little earlier than planned. It's a straightish route up to the road, though we have to take a right at a T-junction when our instinct would have said go left. 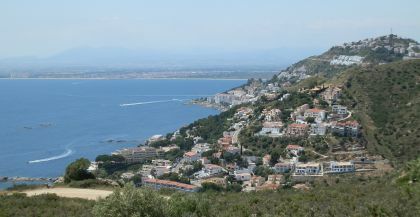 The road is the connecting road from Roses to Montjoi and there are a handful of cars, but being high up the views are immense over coastline. At sea level in the distance we can see a light mist rising around the base of the distant cliffs. It's not unusual to get sea mists in early summer or autumn when the air temperature and water temperatures are far apart. 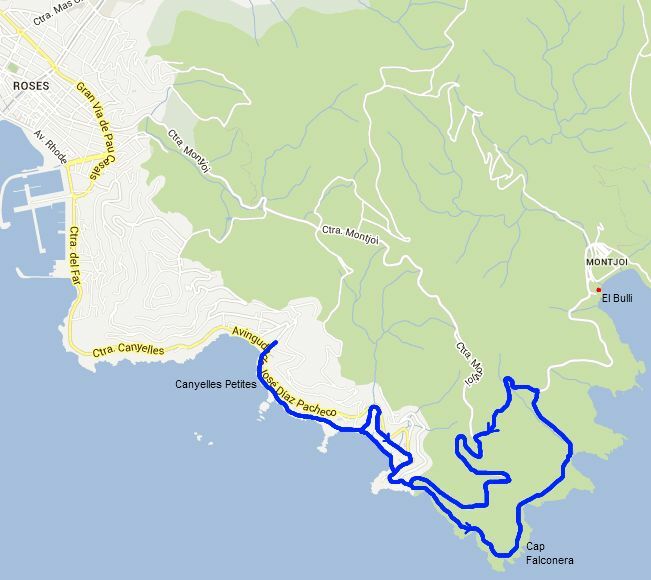 At the top of the road above Cap Falconera, we decide to take a gravel road down. Again, the connecting paths back to Canyelles aren't so great on the map, so we take the road down. At the bottom is a picnic site and some of the orienteerers seem to have finished and are eating and sharing stories. The road returns us to Canyelles Grosses. This time, being hot and sweaty, some of us go down to the beach and into the water.As the temperatures heat up, the water will continue to get hotter through the summer, but in June it's chilly, though passable. We swim a little then meet up with the rest of the party at the far end of the beach and follow back round the headland to the car. The restaurants have filled up with people eating great plates of Paella and seafood. We return to the car and head back to Figueres for shopping.